As we start 2019, I’d like to reflect on what a fantastic year 2018 was for Solar United Neighbors in Virginia. Our solar movement of more than 11,000 supporters across the commonwealth is growing stronger by the day. We’re working to amplify your voice and build a clean, equitable energy system that directs control and benefits back to local communities—with rooftop solar as the cornerstone. This is what you helped us achieve last year! 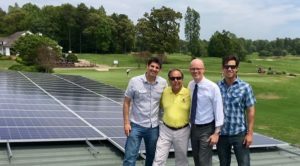 Kiskiack Golf Club became the first golf course in Virginia to go solar in May 2018. Our solar co-ops across Virginia—from Arlington to Roanoke to Richmond and Hampton Roads—helped more than 100 homes and businesses install nearly 1,000 kW of solar capacity. We installed solar panels on the first golf course in Virginia go solar as part of the Hampton Roads Solar Co-op at Kiskiack Golf Club in Williamsburg. We launched the first solar EV co-op in Arlington and have installed nine Level 2 EV chargers for homeowners looking to decrease the time it takes to re-charge their electric vehicle. With the support of our fantastic local partners around the commonwealth, we educated nearly one thousand community members about solar energy through our free public information sessions. We’re building a constituency of Virginians like you who believe that distributed ‘rooftop’ solar is the best way to build a resilient and equitable energy system that offers clean choices and energy freedom for all consumers. More than 700 solar supporters have sent their representatives in Richmond our Virginia Declaration of Solar Rights, demanding a commitment to good solar policies that benefit all Virginians and making it clear that we will no longer stand for monopoly utilities rigging the energy policy game. We mobilized more than 200 solar advocates to submit written comments to the Virginia Energy Plan while others attended in-person meetings to support the inclusion of distributed solar in the plan. We also helped homeowners fight back against unnecessary restrictions by their homeowners’ association that kept them from going solar on their own property. This year also marked the launch of a new campaign in Rappahannock Electric Cooperative territory that we’re proud to support. The Repower REC campaign is building power and organizing to bring transparency and member control to one of Virginia’s largest rural electric cooperatives. That campaign is far from over, but we’re gaining momentum and looking forward to a big 2019! All of these exciting policy developments have helped us lay the groundwork for our first Virginia You can join us to let your representatives in Richmond know that you’re a solar voter! Our community of solar supporters doesn’t just talk the talk about solar—you really show up! Well over 100 solar supporters traveled to George Mason University in October for the 3rd Annual Virginia Solar Congress. More than 150 solar homeowners and businesses across the commonwealth participated in the National Solar Tour, helping to make 2018 the largest year yet in the history of the annual event. Thank you for making our community so special and for continuing to fight for a brighter solar future in Virginia!